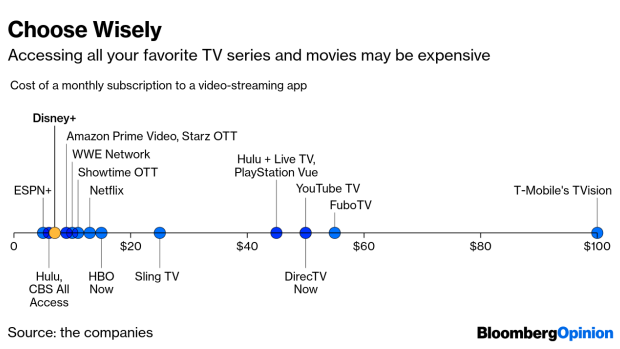 (Bloomberg Opinion) -- The TV-entertainment industry has managed to turn the conventional wisdom regarding market competition on its head. There are more ways than ever to watch TV, yet for many people that won’t translate into greater choice or saving money. Walt Disney Co. unveiled Disney+. Beginning Nov. 12, it will be the exclusive home for a ton of the company’s new and old content. For superfans of Disney’s brands, such as Star Wars, and for parents of young kids, the $6.99-a-month subscription (or $69.99 a year) may be well worth it. Others will have to decide if it’s yet another app worth signing up for, or if they’d rather just keep their money. I’m not even convinced the price will stay that low for long – Disney’s left a lot of room to catch up to Netflix Inc.’s $12.99-a-month standard fee. Meanwhile, YouTube TV raised its monthly subscription fee by $10 to a whopping $49.99. Eight Discovery Inc. networks were also added to its lineup, including HGTV and TLC. However, the combined affiliate fees for those channels are little more than $1 a month per subscriber, meaning they don’t come close to explaining YouTube TV’s significant price hike. T-Mobile introduced TVision, a $100-a-month package of more than 275 channels – a couple hundred more than most people care to have. Initially it will require a cable box, just one more reason TVision looks like a glorified cable package. The only real improvement in consumer choice is the ease of canceling. That can be done online with basically the click of a button, and it’s just as easy to sign back up when there’s a show you don’t want to miss. For example, fans of "Game of Thrones" – which returned Sunday night for its final season – could pay the next two months for HBO Now and then quit until the network's next big series. Cable packages, by comparison, are notoriously difficult to get out of and require begrudging calls to customer service. But if canceling is the streaming industry’s biggest selling point, then that’s a problem. This is why, to me, Netflix still stands out as the simple, affordable, good-enough option. (We’ll learn how many customers it enticed during the latest period when the company reports results at the close of trading Tuesday.) That said, Disney, for its part, is exploring how it can take advantage of bundling opportunities by offering a discount to those who subscribe to all three of its apps: Disney+, Hulu and ESPN+. The company made a move toward this on Monday in announcing Hulu will buy out AT&T Inc.'s 9.5 percent stake in the streaming company for $1.43 billion. Disney, which owns a majority stake in Hulu, will bill the combo of the three apps as the complete package, ticking the boxes for family content, adult content and sports. In reality, though, there are still a lot of holes.